The cruise control system allows the driver to set and maintain a steady driving speed. The system is designed to maintain speed over a variety of driving conditions including slightly hilly terrain and moderate winds. Most systems provide speed adjustment capabilities, allowing the driver to change the speed of the vehicle to match driving conditions without disengaging the cruise control. There are a variety of cruise control systems in use today. Most share similar components and basic operating system design. The variation lies in the control module and throttle actuating system used. Some vehicles use a stand alone cruise control module, while others will incorporate the cruise module as a function of the engine control module. Two basic type of throttle actuating systems are used. The vacuum servo system and the electro-mechanical system. The most common type is the vacuum actuated cruise control system. This system uses an engine manifold vacuum acuated servo to provide throttle control. Manifold vacuum is supplied to the servo via a vacuum supply hose. The vacuum supply system generally contains a vacuum storage canister, and/or a one way check valve. This helps to provide a reserve vacuum supply during low engine vacuum periods, such a heavy engine load conditions. The cruise control servo contains a vacuum diaphragm that is connected to the throttle lever using a cable, chain, or linkage rod. Speed control is provided by using electronic signals from the cruise control module, or engine control module, to modulate vacuum inside the cruise servo. The cruise servo will vary throttle position by applying the modulated vacuum to the diaphragm to set throttle position. Most vacuum actuated cruise control systems use a vacuum release valve as a back up cruise disengagement mechanism. The vacuum release is normally connected to the brake pedal and is designed to dump cruise vacuum when the brake pedal is depressed. The electro-mechanical system uses a electronically controlled stepper motor to maintain throttle position. The advantage of this system is that it does not have to rely on a constant source of engine vacuum to operate. Typically this system will combine the stepper motor, throttle actuating cable, and the control module into one unit. Vehicle speed data and driver input information are supplied to the control module. The control module processes this information and controls vehicle speed by sending commands to the stepper motor, which in turn actuates a cable to move the throttle to the desired position. The stepper motor generally does not produce enough torque to directly actuate the throttle cable. Instead it is connected to a device designed to multiply stepper motor torque, and hold throttle position. The operating switches, used on the cruise control system, can consist of an on/off switch, set switch, coast switch, and an accelerate switch. 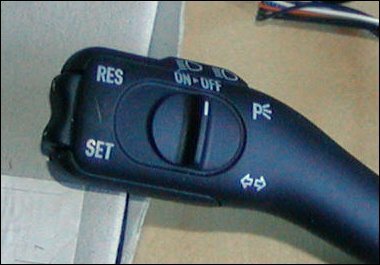 In addition, back up cruise disengagement switches are mounted on the brake pedal, and the clutch pedal (when equipped). Most of these switches operate by sending low current voltage signals to the cruise module or the engine control module. Diagnosing cruise control systems of course requires nothing less than the offical manufacturer’s auto repair book, which will contain the wiring diagrams necessary for proper troubleshooting. 1 Comment on "Cruise Control"
2003 Toyota corolla ce, told cruise is “stuck” and quotes are 150 and up. told this is a cable version.